Internet Relay Chat is a worldwide text chat service with many thousands of users among various irc networks. The Freenode IRC network hosts the very large #haskell channel, and we've had up to 1046 concurrent users, making the channel consistently one of the most popular of the thousands of channels on freenode. One famous resident is Lambdabot, another is hpaste (see the Bots section below). The IRC channel can be an excellent place to learn more about Haskell, and to just keep in the loop on new things in the Haskell world. Many new developments in the Haskell world first appear on the irc channel. As always, #haskell remains the primary place for new user questions. 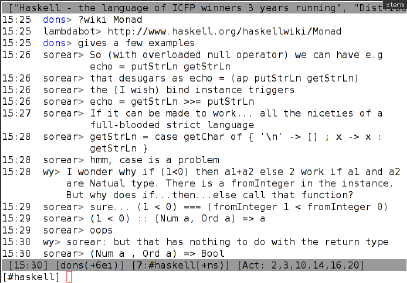 If you point your irc client to chat.freenode.net and then join the #haskell channel, you'll be there. Alternately, you can try http://webchat.freenode.net/ which connects inside the browser. The #haskell channel is a very friendly, welcoming place to hang out, teach and learn. The goal of #haskell is to encourage learning and discussion of Haskell, functional programming, and programming in general. As part of this we welcome newbies, and encourage teaching of the language. Part of the #haskell success comes from the fact that the community is quite tight knit — we know each other — it's not just a homework channel. 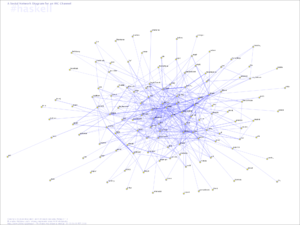 As a result, many collaborative projects have arisen between Haskell irc channel citizens. Low to zero tolerance for ridiculing questions. Insulting new users is unacceptable. New Haskell users should feel entirely comfortable asking questions. Helpful answers should be encouraged with name++ karma points, in public, as a reward for providing a good answer. Avoid getting frustrated by negative comments and ambiguous questions. Approach them by asking for details (i.e. Socratic questioning), rather than challenging the competence of the writer (ad hominem). As the channel grows, we see a diverse range of people with different programming backgrounds getting accustomed to Haskell. Be patient and take satisfaction from spreading knowledge. 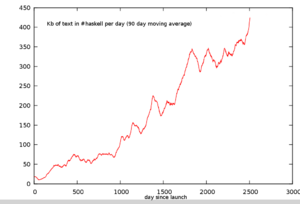 The #haskell channel appeared in the late 90s, and really got going in early 2001, with the help of Shae Erisson (aka shapr). The Freenode staff have asked us to consolidate language channels into the "#haskell-" namespace rather than have them continue on in the "#haskell." namespace. Eventually the language channels below listed with "#haskell." will have to move. #haskell.ru Russian speakers. Seems that most of them migrated to Jabber conference (haskell@conference.jabber.ru). #haskell_ru Russian speakers again, in UTF-8. For those, who prefer good ol' IRC channel with a lambdabot. 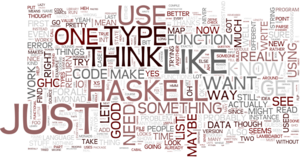 #haskell-beginners Haskell people focused on teaching and learning Haskell, not just beginners. #haskell-in-depth slower paced discussion of use, theory, implementation etc with no monad tutorials! #haskell-apple projects that target iOS or OS X using Haskell. #haskell-lisp Haskell Lisp - projects that are creating Lisps written in Haskell, or Haskell implementations written in Lisps. #haskell-robotics Discussion about the use of Haskell for robotics applications. There are various bots on the channel. Their names and usage are described here. Lambdabot is both the name of a software package and a bot on the channel. It provides many useful services for visitors to the IRC channel. It is available as a haskell package and can be integrated into ghci. Details on the software are found on a separate wiki page. lambdabot's commands are prepended by a '@' sign. @help display help to other commands, but help text is not available for all commands. @tell <nick> <msg> -- same as @ask Next time <nick> speaks in channel they will be notified they have a message pending and how to receive it. help COMMAND displays help to other commands. NICK++ / NICK-- in/decrements the karma of NICK. tell / ask sends NICK MSG a message when she becomes active. xseen see 'seen' ?? any difference ? The hpaste bot provides a notification interface to the hpaste pastebin. Emacs integration is available. The hackage bot provides real-time notifications of new package uploads to Hackage. To get an overview of where everybody on the channel might be, physically, please visit Haskell user locations. This page was last modified on 10 April 2018, at 08:52.